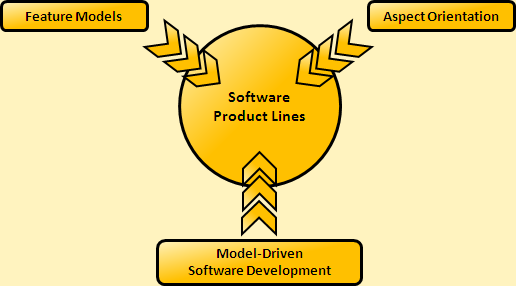 Software Product Lines aim at reducing the development effort for sets of products which share a common code base. Currently, classic techniques, like inheritance and conditional compilation are used for this purpose. Features often are not modular but influence several distinct locations in an application (cross-cutting concerns). Using aspect-oriented techniques and concepts, those features can be woven into the program during model transformation. The feasiPLe projects aims at the evaluation of existing software product line methodology and the development of quality metrics to provide sophisticated concepts for the modeling of variants and their implementation using model-driven development and aspect-oriented methods.